One switch for GO, one switch for SPIN! 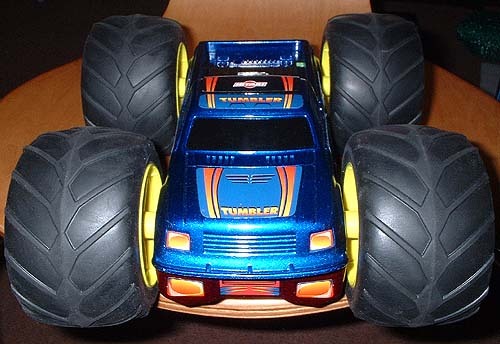 Hitari Tumbler radio controlled cars, adapted for switch use. 27Hz or 40Hz available - Race two cars at once! Adaptation Service - £50 to adapt a full-function Tumbler. Do it Yourself - Adapt your own R/C Tumbler. Fowler Electronics - Spare batteries and parts. Skittles and 10-pin bowling: Use tin-cans for extra noise. Stunt Competitions: Longest jumps, best flips, best crash. Art: Get a huge sheet of paper, then paint the tyres. Football: 2 cars and an inflatable beach ball. Cross a line for a goal. Paddling pool mayhem: Fill a paddling pool with balloons instead of water. Put in a car - set a time limit - 10 points for burst balloons, 1 point for every balloon knocked out of the pool. Remote control Helium balloon: Tie a helium balloon to the car, then fly it around a room. Very visual.